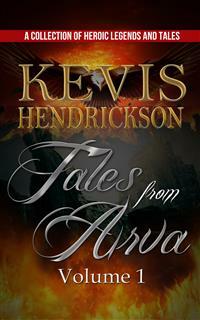 Read this exciting collection of short stories taken from the World of Arva. Tales from Arva: Volume One includes The Fall of Ithar, The Grey Elk, The Tale of Liril, Pryde's Choice and bonus material (including an excerpt from the upcoming The Prince and the Demon Novella). Tales from Arva: Volume One is a collection of short stories, legends, and poems ranging from the elusive Elder Days to the last age from Arva. It comprises such events as the retelling of the Great War fought over the last kingdom of Men to the stirring tale of a knight’s quest for redemption. It is the hope of the author that readers of this volume will find the world of Arva to be a most fascinating place that they will want to visit time and again. In ancient days when the race of Men had first come into the world, there were the Faranir, the fell gods of old, who had made war upon the children of the world and made them subject to their will. Men, too, fell under their dominion and suffered greatly. In those days, there was born to Garâthês, the king, a son. And he was hight Garâthos. Garâthês raised Garâthos to grow proud and to become a beacon of hope to Men. When Garâthos’ strength waxed, he sought to test his mettle and was of mind to seek the holy sword Valix. For he perceived that with such a weapon he would become a mighty foe to his father’s enemies. One night, it came to Garâthos in a dream where he might find Valix. And he was consumed by the thought of possessing it. He knew that whatever trials lay before him, or dangerous road he must travel, Valix would be his. Without delay, Garâthos departed from his father’s kingdom to seek Valix. There abroad he faced many dangers that would have conquered lesser men. But he overcame them all, slaying man, beast, and phantom till he ventured into strange lands far from his own where his prize awaited him. When his quest was won and he claimed Valix for his own, Garâthos returned home to take his place beside his father. And it came to pass that whenever battle was raised, Garâthos went forth and smashed his foes with Valix. His deeds were great and many and he was renowned for his feats. Fearing that Garâthos’ fame would only grow to embolden others to rebel against their Faranir masters, the dark lord, Mjôrl-gâs plotted his death. And a great army was assembled to lay siege to the kingdom of Ithar, the last bastion of Men, that Garâthos and his people would be utterly destroyed. Here is the telling of that account. It was on a day when the sky was grey and a bitter wind descended upon the land that the armies of Mjôrl-gâs drew about Ithar. They set upon the great walls that stood about the kingdom and beleaguered it. Such was the strength of his foe that Garâthês the king took up his war gear and rode into battle with his sons Garâthos and Garâthon. And a great battle was made on the Plains of Isultnarthinal which lasted for three days and in which many men were killed. But the valiance of the king and his sons was such that they overcame their enemy. Then Garâthês raised up his sword with his sons and let out a cry that roused all the men with them to lift up their voices as well. And the plains were filled with a great cheer as had not been heard in them before and has never been heard in them since. Word spread throughout the kingdom of the king’s victory over the dread army of Mjôrl-gâs and the people’s hearts swelled with hope. But alas, that hope was not to last. For less than a fortnight after Garâthês’ victory, a darkness came over the land. It was by some power that the sun, which had cast its glare on the heights of the mountains of Âs-harâthen, ceased to shine. A deep shadow fell upon the land to cloak all in darkness. And the hearts of Garâthês and his sons and their men were become grim with dread. Then came the dark ones known as the Hapheliaum, which Men call the Shadow-Kings. And their appearance was that of a sinuous black cloud that reached far and wide; and there was a gleam spilling from their crowns that was as long tendrils of bright yellow flame. Their raiment was dark as pitch and their eyes were filled with a red plume like fire. And they set upon the army of Garâthês. Those men who stood on the battlefield to defend their lord were made to cower before them. Even though the essence of the Shadow-Kings consumed the ranks of Garâthês’ army, he and his sons remained to do battle with their foes. And many Men who did not fear death, out of loyalty to their king, gave their lives in defense of their lord. However, the Hapheliaum knew that so long as his sons fought beside him, Garâthês would not fall and battle would be prolonged. So they summoned a great army of serpent beasts and goblins they had concealed within the fog of mist and shadow and unleashed them upon the battered forces of the king. Numberless as the stars was the enemy and all who looked upon them quailed. Garâthês marshaled his men to defend their rear. But his army was broken by the enemy’s charge and the ranks of his forces were split in twain. Thus were Garâthos and Garâthon made separated from their father. Thereafter, Garâthês was set upon by the lord of the Shadow-Kings himself and was slain. It was when Garâthos had sought to rejoin his father in battle that the lord marshal told him of his father’s fate, and that his brother Garâthon, too, had fallen. And so, in grief too great too tell in tale, Garâthos perceived that he had now become king and that his enemy would pursue him to the death so that he, the final ruler of men, would not live to lead Men’s war against Mjôrl-gâs. Garâthos knew that it would not be long before his foes slaughtered the last of his men and Ithar fell. He retreated from battle to return to Castle Isultthain, for he feared for the life of his mother and his beloved Aradhel. There he met them and was received with sweet kisses, for Queen Thesá and Aradhel were both of great cheer that he was not grievously hurt. No words were made between them of the king’s fate or that of his brother. Such was their hue that he knew they were already grieving for the loss of his father. From a wide terrace in the castle that overlooked their kingdom, Garâthos and his mother Queen Thesá, and Aradhel, too, gazed into the distance to see the smoke that rose from within the walls of the city. Their hearts were greatly wounded by the sight of fell armies marching through the streets, for all they had fought to protect was now being brought to ruin. Raging flames devoured all that was fair and good in the city. And the cries of the people could be heard from the castle. They had espied from the terrace the advance of the enemy and seen the black horses on which rode the Hapheliaum, and with them the fell men of Dorodeim, Hraithdeim, and Faugthdeim who now aided in the slaughter.